Share the post "A Day Without Fear"
Oh what a sunny and mild winter day we had today. As we move closer to the end of this month, there will be left only 3 months of possible inclement winter weather to endure before Spring arrives again in its glory. Enduring the process of a relative’s death this past week has re-affirmed the true value we must all place on every new day that arrives when we wake from our night’s rest. Too many of us believe we have our futures planned and the where and when transitions will take place, but there is always that mysterious hand of fate that reaches down and carries us off to another dimension. It saddens me to find people fretting year after year over something they have absolutely no control over. One day several years ago I asked a client why she didn’t go somewhere warm during the winter because she has a large amount of vacation time banked. To my surprise her teary-eyed answer was, “I’m afraid to leave town in case something would happen to my mom.” I backed away from that for fear of getting pulled into some sort of dark tunnel where fear begets more fear until one’s whole life is filled with fearfulness. After she left I started thinking about her statement and sort of connected the dots with what she said and it really didn’t make sense because if she were either here or out of town, no one could stop something from happening to her mother and even if it did, there were others who would do what was necessary until she returned. I spoke some years ago with a mutual friend about a gentleman whom we’ve both known for a long time. The subject of conversation was how successful he became as well as the numerous times he was in both financial as well as physical harms way and seemed to pass through them as one who walks across burning coals without harm. I believe the key to his life successes was his mindset of fearlessness. I remember him saying once, “So what if I fail. If failure arrives, then I’ll just pick myself up, dust myself off and start all over again.” That statement of fearless determination is a sign of how far down on the totem of his daily thought patterns fear is stationed. Way back in my history of debate, I have challenged many to convince me otherwise that fear is the greatest evil in our world. Think about it for a moment. Fear of failure, fear of growing old, fear of not having enough money, fear of not being popular, fear of not having control, fear of not having enough intelligence, and the examples go on and on. 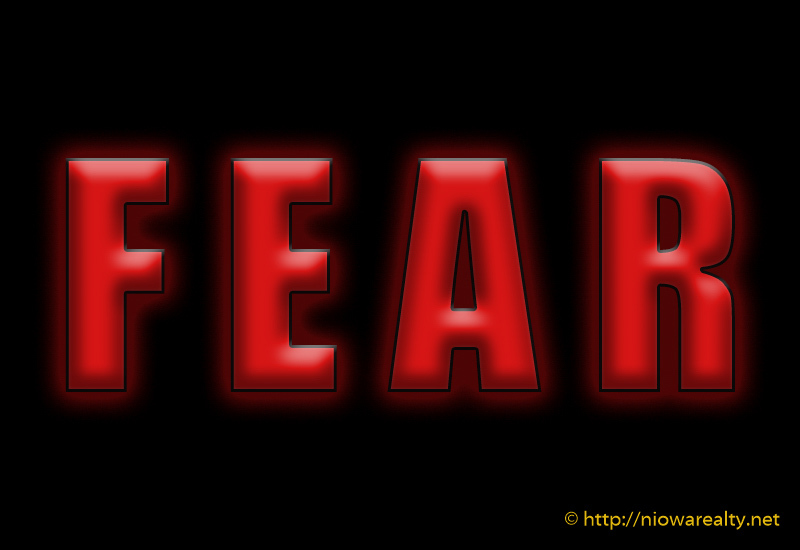 From the root of fear sprouts all the evils we are faced with on a daily basis. With that said, I now challenge you all to attempt to live but a day without fear at your side.